France conducted numerous space and missile launches from Algerian territory from 1947-1967. These facilities were abandoned as a condition of the agreement ending the Algerian Civil War. Algeria did not take concrete steps to return to space until the 1990's, when the decision was taken to participate in an international constellation of disaster-monitoring satellites. Space activities began on Algerian territory in colonial times with the constellation of launch complexes and nuclear weapons test sites established by France as the Special Weapons Test Center (CIEES). This began operations at Colomb-Bechar on April 24, 1947. Launch operations were moved to Hammaguira in 1952, supplemented by Reggane from 1961. 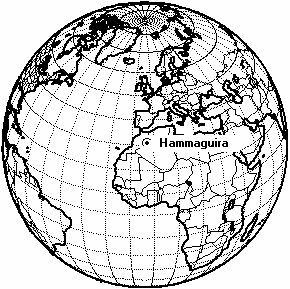 France's first launch to orbit took place from Hammaguira in 1965. The evacuation of these launch sites was a condition of the final agreement signed in March 1962 that ended the Algerian Civil War. The sites continued in use until finally turned over to the Algerian government on 1 July 1967. Algeria did not take concrete steps to return to space until the 1990's, when the decision was taken to participate in an international constellation of disaster-monitoring satellites. Algeria's first satellite was launched on November 28,2002. Space affairs were run by the National Centre for Space Technology until 2003, when this was replaced by the Algerian Space Agency. Spacecraft: MicroSat-100, Myriade. Launch Vehicles: R-14, PSLV. Projects: Alsat. Launch Sites: Hammaguira, Plesetsk, Reggane, Sriharikota. Stages: Stromboli. Agency: STA, ISRO, Surrey, NCST. 1954 April 9 - . Launch Site: Hammaguira. LV Family: Stromboli. Launch Vehicle: SE4400. Nation: Algeria. Agency: STA. Apogee: 0 km (0 mi). 1955 October 5 - . Launch Site: Hammaguira. LV Family: Stromboli. Launch Vehicle: SE4400. Nation: Algeria. Agency: STA. Apogee: 20 km (12 mi). 1955 October 8 - . Launch Site: Hammaguira. LV Family: Stromboli. Launch Vehicle: SE4400. SEPR 505 booster - . Nation: Algeria. Agency: STA. Apogee: 20 km (12 mi).